This has been one of the busiest summers for my family in years: weddings, births, camping trips, family get-togethers, birthdays. From mid-May through September, we spent nearly 12 weekends away from home. 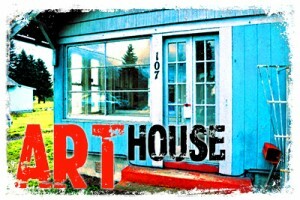 I hadn’t touched the Art House for more than four months. With winter just around the corner, the first priority was to provide a source of heating for the Art House so I could continue working through the cold months ahead. I had already removed the oil burning furnace back in April. Not only was the unit beyond recovery, but the cost of fuel oil is prohibitive. 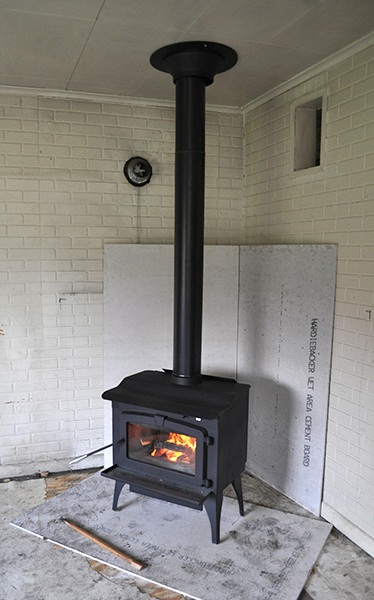 Besides, I wanted to install a wood-burning stove. Something to give the house a warm and cozy feel. The mortar on the ancient chimney was basically sand. Step 1 was to remove the old brick chimney, not as difficult as I first imagined, since the mortar essentially crumbled in my hands. 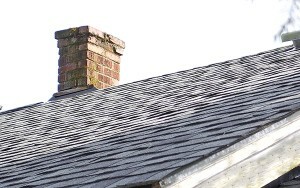 A few quick taps with a hammer and I was able to push the chimney off the roof. Inside the attic, same story. The chimney was down in less than half an hour. Chimney pedestal inside the kitchen. 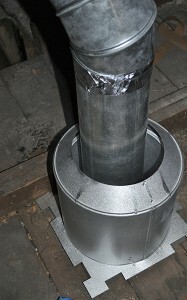 This collar provides an “heat break” between the hot chimney pipe and the surrounding wood. Strangely enough, the chimney did not continue down to foundation of the house. Instead, the base sat on a pedestal shelf that protruded from the wall of the kitchen, with a round opening for the chimney pipe where it used to be connected to the oil furnace. Removing the chimney opened up additional wall space in the kitchen. A nice bonus. 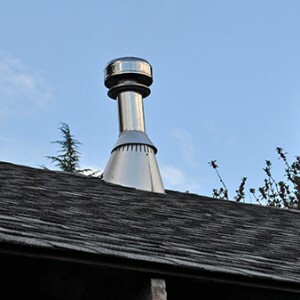 New chimney installed on roof. The next task was to haul the 350 pound wood stove up over the porch and through two sets of doors. I rented a refrigerator dolly to do the job; fortunately, my wonderful neighbors, Kelly and his son, Tristan, were available to lend a hand. Without their help, I don’t think I would have been able to navigate the obstacles hauling a cast iron stove – even with the dolly. I’m planning on adding a tile floor and a brick facade and mantel behind the stove. 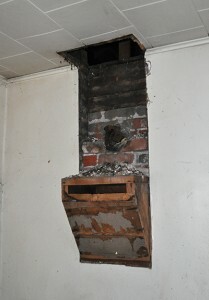 Once the stove was in position, I cut a hole into the ceiling and guided stove pipes through the opening. In the attic, I installed two consecutive 45 degree angles in order to reach the existing hole through the roof where the old chimney once stood. Some missing parts on the chimney stack required a side-trip to Home Depot. Plus a gushing wound in my thumb when a sharp metal edge sliced it open. It stretched the project into two full days, but with patient assistance from my nurse/wife Jamie, we celebrated a successful installation with an inaugural fire on Saturday, Nov. 1st. The wood burning stove is everything I hoped for. It quickly warmed up the living room to a comfortable 68 degrees and radiated heat into the bedrooms. It will keep me from freezing this winter as I tackle the two most challenging projects on my list: fixing the plumbing and completely reinstalling the electric system throughout the house. My back and knees already hurt just thinking about it.